The foundation of great marketing is up-to-date information about the contacts in your audience, including important data like who has interacted with your online store and when they subscribed to your emails. Mailchimp offers powerful and flexible tools that help you manage different types of contacts. We'll cover a few basics about your audience in this article, including what you need to know before you start importing contacts into Mailchimp. How you build and manage your audience affects the ways you can use Mailchimp. With the right data and organization, you can segment contacts based on a variety of criteria and send certain content to target groups. Take a moment to think about your marketing goals, who your contacts are, and what information is relevant to them. Do you have seasonal-only customers, bargain-hunters, or customers who are only interested in certain types of merchandise, services, or events? Are you an organization that needs to send different content to donors, sponsors, members, or other patrons? Does it matter if your contacts are local, domestic, or international? Do you sell products or services online, and ask customers to sign up for email marketing in the checkout process? What other variables affect your audience? Your Mailchimp audience is designed to help you collect and manage subscribed, unsubscribed, non-subscribed, and cleaned contacts. Someone who has opted in to receive your email marketing campaigns. When you create a Mailchimp account, we'll ask you for some information to comply with anti-spam practices and help you track peformance. We’ll use this information to get your audience started. All you have to do next is add or collect some contacts. You can add subscribed contacts one-by-one, upload contacts from a file, copy and paste contacts from a spreadsheet, or use an integration to sync your contacts. We prohibit users from sending to purchased, rented, or third-party lists, so be sure to check our audience requirements before you begin. 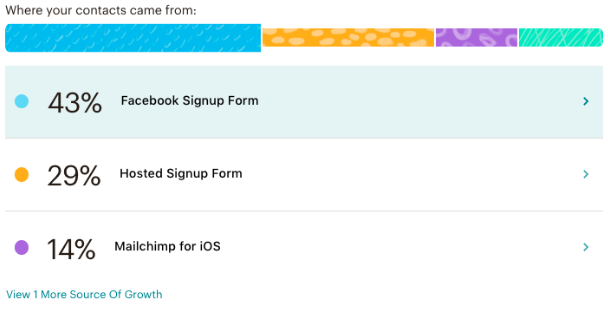 Each Mailchimp audience comes with an associated signup form, which you can customize and share to Facebook, your website or blog, or even a mobile app. Mailchimp provides a lot of field options for you to choose from, so you can ask for the right information from contacts who subscribe. Users with Manager permissions and higher can create interest groups for your signup form and audience. Interest groups can be assigned by you or selected by your contacts, and can be visible or hidden on your forms. Your audience will grow and change as people sign up, unsubscribe, and update their profiles. We recommend keeping an Update Profile link in the footer of your campaigns to encourage subscribed contacts to keep their information and interests updated. You can create segments of your audience based on almost any criteria you can think of, like signup form data, tags, group preferences, and other information collected by Mailchimp, including campaign activity and location. If you integrate an e-commerce platform with your Mailchimp account, you'll also be able to use purchase activity information to segment. The segmenting tool supports up to five criteria, and you can save any segment for future use. Tracking the makeup and behavior of your audience helps you better understand what your contacts want and don't want. You’ll find valuable insights on both your Audience Overview and Stats pages. Your audience dashboard gives you actionable, at-a-glance information to help you learn more about your contacts and how to talk to them. This includes recent growth trends, top tags, top locations, and a breakdown of email marketing engagement. Learn more about the audience dashboard. The Stats overview gives you more specific details about your email marketing. View open and click rates, see how the number of subscribed contacts has changed over time, or compare the performance of your last 30 email campaigns. Learn more about stats.